Did you know that a backhoe loader’s specifications are not translated in the same way as the building specifications for a real estate development? There are many professional sectors that have their own terminologies: from machine instructions to architecture and the automotive industry, from construction to renewable energies, to name a few. Every industry is completely different: for example, in their way of communicating, their target audience, the various fields of action and their professional jargon. If you work thoroughly on all of your professional work, shouldn’t you demand the same care of technical translations? It’s your international calling card, and you shouldn’t neglect it. Technical translations require special execution, and must be performed by professional technical translators who have extensive experience in your industry. In-depth specific knowledge of your professional jargon, the language spoken in your field of work. The support of professionals who specialise in the revision of technical texts. The support of a dedicated project manager who will help you to make the most of your project and optimise both timing and the final price. Reliable, accurate and rigorous: reviews by a specialist technician who is outside of the translation process. Profitable: as we work using reference materials and specialised glossaries, which gradually reduce work hours and costs. For the specific translation needs of companies related to the automotive industry (raw material providers, component research, car manufacturers, spare part distributors, garages, dealerships, etc.) Okodia – Translation Group has the solution: reliable technical translations that comply with all quality standards and make your investment profitable. At this time, many emerging countries are the best financial stage for internationalisation in this industry. Your company should expand its client portfolio to remain competitive. Your company provides cutting-edge quality services in your industry. Your company would make a profit if it managed to work in foreign markets. Your company can be more profitable than it currently is. Now is the time to take action, to open up your perspective and make bids abroad. How? With the support of a specialist partner. Okodia – Translation Group is a team of specialist professionals who will work closely with your company so that your image abroad will bring in the profits you need as soon as possible. Would you like us to help you? Tell us about your project. One of the industries with the highest need of updating and improvement in order to be competitive is the telecommunications sector. As you well know, your company competes against much larger organisations that have almost unlimited resources. What are your two main competitive advantages? Specialisation and product and service customisation. Your products and services are just as high-quality as the most demanded ones, or even higher. You know it, your employees know it, but does your end client know it? This client who wants to learn about your products, but who lives in China, India or Russia. Your products and services are high-quality, equal to or better than those of other companies. You provide a specialist service, adapted to your clients’ real needs. Your prices are as fair and competitive as your figures allow. Your company has the best telecommunications professionals, who contribute added value to your offer. Your technical knowledge enables you to easily reach market niches in different countries. Our knowledge of translation will enable you to communicate in those markets in the right language. Having a professional partner like Okodia will add immediate value: your company will speak your clients’ language wherever they may be. What are you waiting for to launch a profitable internationalisation process? Did you know that a mere translation mistake can lead to financial losses for billions of euros? Utilities, environmental consultancies, legal firms… the renewable energy industry is perhaps one of the sectors that most documents generate. Specialised documents with their own terminology – a vocabulary that only a specialised translator knows and handles. If your company needs to expand and consolidate its international client portfolio. If your company is subject to continuous legal changes, both national and international, and these changes must be reflected in the documents that you generate. If your company wants to continue to be a flagship in your industry and beat increasingly active competitors. If your company wants to continue to do work that is eco-friendly towards the environment and profitable for its cash flow. Okodia – Translation Group makes a group of native translators, who specialise in the renewable energy industry, available to your company. These are industry insiders who speak your language and know how to convey it in a simple, direct and profitable way. We help you to make the most of your company’s investment. Over the last 5 years, we have seen how the civil engineering industry has reinvented itself. Local companies have taken the leap and now make bids in international tender processes. They seek and find their market niche in developing countries, launch large, ambitious projects involving professionals from different fields of work, and invest time and thousands of euros in positioning themselves in distant locations – countries with completely different cultures, laws, and work habits from those we are used to. Your company to return to the top of your industry. Your professionals, partners and investors to once again make the profits that you used to have. Your company to be as profitable as it used to be before the crisis. The solution is at hand: internationalise your products and services by means of a crucial investment – professional accurate translations. 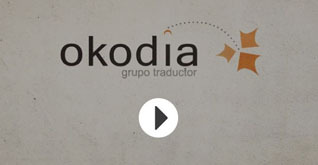 In Okodia – Translation Group we don’t only translate your texts from one language into another. We offer you a comprehensive localisation service. Our specialised native translators not only know the vocabulary in their mother tongues, but also the specific industry and the local culture in their countries of origin. As you well know, the secret is not in “translating”, but in “translating well”. Okodia knows how to do it. If there is an industry that is involved in practically all aspects of everyday life, it’s the chemical industry. From the water we drink to the medicines we take, through clothes, toys, household appliances, cleaning and beauty products, food supplements… The “trillion industry” moves hundreds of millions of euros every year, but also has a heavy burden: the health and wellbeing of final consumers of their products. Become a part of the “trillion industry”. Beat the strong competition from emerging countries. Project the image of an organisation that is committed to the environment and your clients’ safety and health in the market. Achieve higher returns in your international investments. Okodia offers you its extensive experience to help your company in specialised chemistry translations. We provide translators who are certified in different countries, specialists in the different areas in the chemical industry who will translate the contents of your documents into your clients’ languages. English, French, German, Russian, Chinese, Arabic, Danish, Finnish… A professional, reliable and rigorous translation will add value to your work and your investment. Architecture firms, construction companies, real estate firms, real estate developers, building material manufacturers, renovation firms, interior designers… As your experience will tell you, your industry, in addition to using its own terminology, has its own style, a specific way of writing. The complexity of this special language, this way of talking about things, is further increased by the importance of text contents and the variety and number of companies involved in a single project. Do you know about the advantages of having good technical translations and why technicians and engineers prefer direct, clear and transparent language? In machine instructions and manuals: save time and costs using accurate translations. Avoid work stoppages and unnecessary repairs. In work processes: increase your team’s understanding of instructions and methods. Facilitate work flows. Improve your employees’ productivity. In technical specifications: balance your financial plans and avoid mistakes in the attribution of budget items. As you can imagine, these and other benefits become particularly important in internationalisation processes and in projects in countries where your language is not spoken. Would you like us to examine your project and give you sound reasons to work with Okodia – Translation Group?